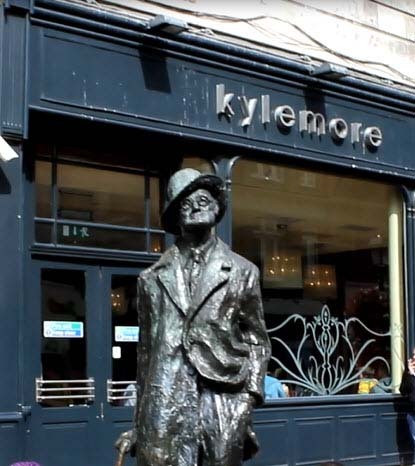 Join one of the most influential writers of the 20th century on his travels through 1904 Dublin from No 7 Eccles St where Leopold Bloom began his epic day in Ulysses (the house was knocked down some years later though the front door salvaged and now resides in North Great Georges Street). Listen out for the bells of St George’s Church, Hardwick Place, (Dubliners) onto Belvedere College, where Joyce was a scholarship pupil, past the Parnell Statue. 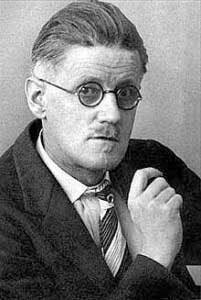 (Joyce was greatly influenced by his ideals) down past the Rotunda (in Joyce’s time it housed a concert hall) past the Gresham Hotel where the Conroys spent the night (The Dead). At the GPO, trams started for Blackrock, Kingstown and Dalkey. Today the (Daniel Day) Luas passes nearby. On across O’Connell Bridge Bloom bought some cakes to feed to the gulls (some are still alive today – only joking) and to the southside of the city up past Trinity College (Joyce was forbidden to attend as a Catholic), the Bank of Ireland, College Green (once the seat of the Irish Parliament) around into Nassau St where, Joyce met Nora and asked her for a date though she stood him up (they were meant to meet at the historic No.1 Merrion Square, (Wilde’s father practiced here) and on up to St Stephen’s Green and past The Shelbourne (mentioned several times in Joyce’s books) and out to Sandycove to the Martello tower, the setting for the first chapter of Ulysees. If you are exhausted even reading about it, rest easy in some of Dublin’s finest luxury hotels including Conrad Dublin, The Clarence and The Beacon. Error: Error validating access token: Session has expired on Monday, 22-Apr-19 15:56:05 PDT. The current time is Tuesday, 23-Apr-19 01:25:13 PDT.